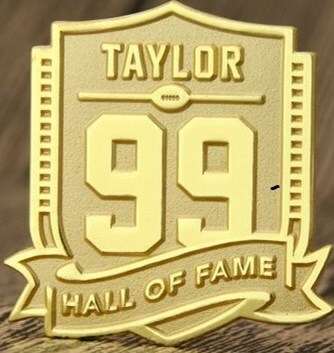 This 99 logo was a sort of secondary mark for Jason Taylor's HoF induction. The hall of fame custom pins is in honor of the Hall of Fame Induction Ceremony which includes Jason Taylor. The hall of fame custom pins made by GS-JJ, enamel pin maker. It is crafted by sandblast, die struck with gold finish. The color is uniform, exquisite workmanship. Each of hall of fame custom pins are individually poly bagged and fixed by a butterfly clutch back. GS-JJ can provide many different custom enamel pins at the lowest price.